Choosing the right trailer for your business, lifestyle, or job, is not always an easy decision. Luckily, our experts at M&G have done the research for you. Read below to find out which type of trailer is right for you. Open trailers are often referred to as utility trailers, meaning they can be used for many different things. Utility trailers are non-motorized trailers that can attach to your towing vehicle and come in all different sizes. They are also available in different materials, including steel and aluminum. Aluminum is lighter and easier to pull, but can also be more expensive. Steel trailers have a lower flex point, so they are able to keep their rigidity longer than most aluminum trailers. Some things that can be hauled with a utility trailer include boats, lawn mowers or other equipment, furniture, motorycles, bikes, and ATVs, building supplies, trash, and more. Utility trailers are easy to use and often include LED lights, tie down loops, rails, and ramps for easy loading and unloading. M&G carries a large selection of utility trailers from one of the nation’s top manufacturers, Aluma. Enclosed trailers come in a variety of types, including snowmobile trailers, cargo trailers, car trailers and aluminum trailers. Much like open trailers, enclosed trailers have many different uses, and each type of trailer is designed specifically to meet your needs. Enclosed snowmobile trailers often include things such as ski hold down bars, snow slider channels, dome lights, helmet racks, and lined walls and ceiling. 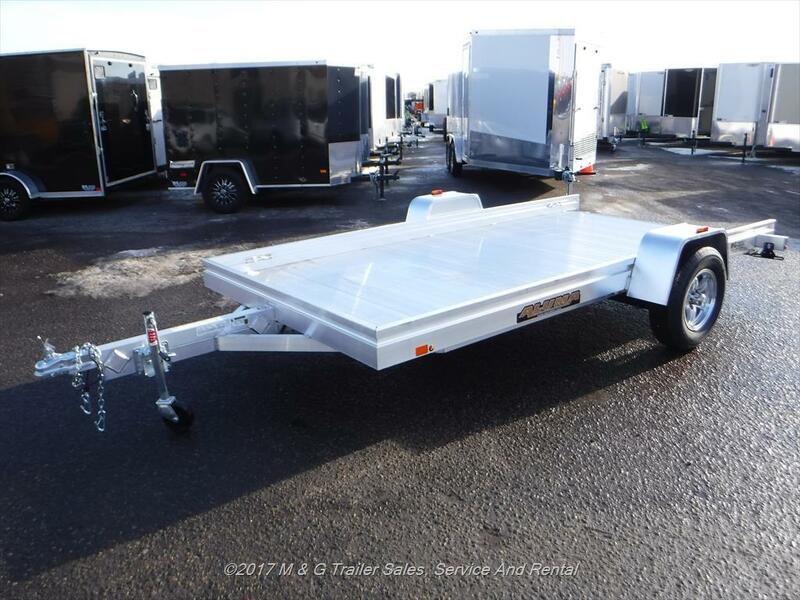 While snow trailers are designed mainly to tow snowmobiles, cargo trailers are much more versatile and can be used for any precious cargo such as furniture and electrical equipment, to name a few. Cargo trailers also come in different sizes and designs, depending on the manufacturer who makes it. M&G Trailers has cargo trailers from Aluma, H&H and RC Trailers. Another popular type of enclosed trailer is the car trailer, made specifically to tow automobiles and protect them from rain, sun and other hazardous elements in the environment. Car haulers tend to be larger than some other types of trailers, and can include features such as rock guards, v-shaped nose, ramps with cable assist, and LED lights. 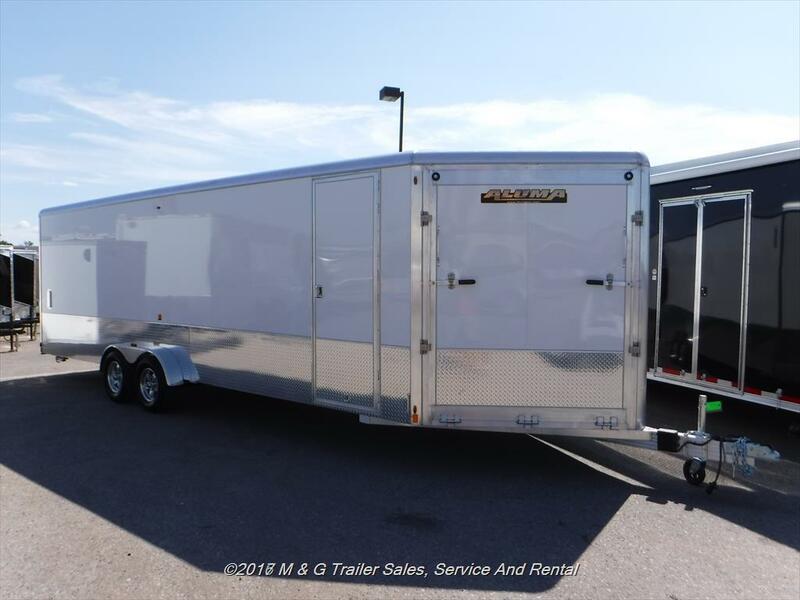 Finally, M&G trailers carries a special line of aluminum enclosed trailers, made for the driver who wants dependability and carrying capacity, without the weight of a steel trailer. When you have a tough job on your hands, a dump trailer will become your best friend. These trailers are perfect for moving heavy materials such as rocks, mulch, stone, and other home improvement or construction materials. Dump trailers are easy to load and unload and easy to tow. Some of the top manufacturers for dump trailers include H&H, Midsota, PJ trailers and Sure-Trac. 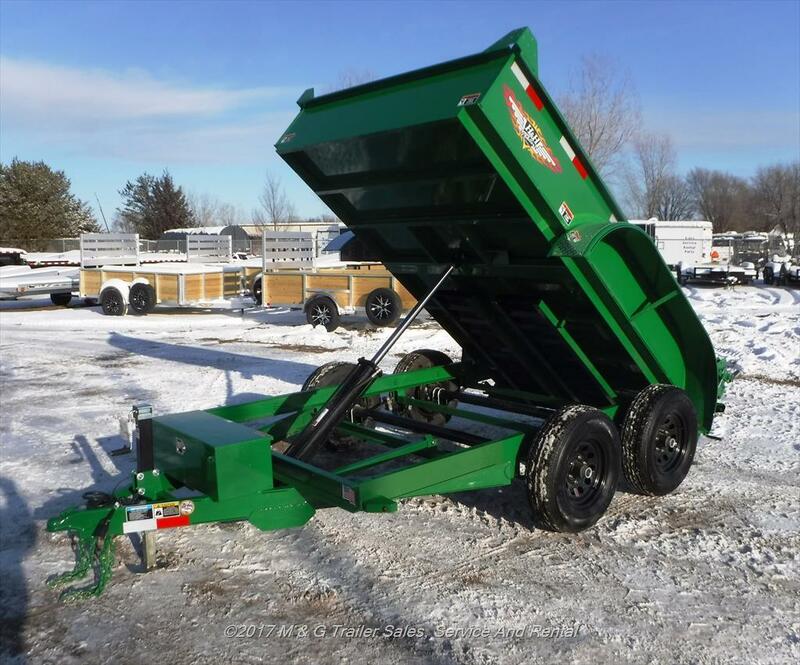 Dump trailers come in different sizes and varieties, such as utility and heavy-duty. Heavy duty trailers tend to be heavier, larger and have higher sides. Trailers can do more than just tow cargo, they can also be used for business. M&G Trailers offers concession trailers that are perfect for athletic events, food trucks, vendors, and much more. We have currently sold some out of our RC concession trailers, but give us a call and ask about new arrivals coming in daily. Which Trailer Should You Buy? Deciding on which trailer to purchase all depends on how you expect to use it. If you’re looking for a heavy-duty trailer that won’t lose rigidity over time, opt for a steel open or enclosed trailer. If you need to protect your cargo from the elements, an enclosed trailer would be the best option. 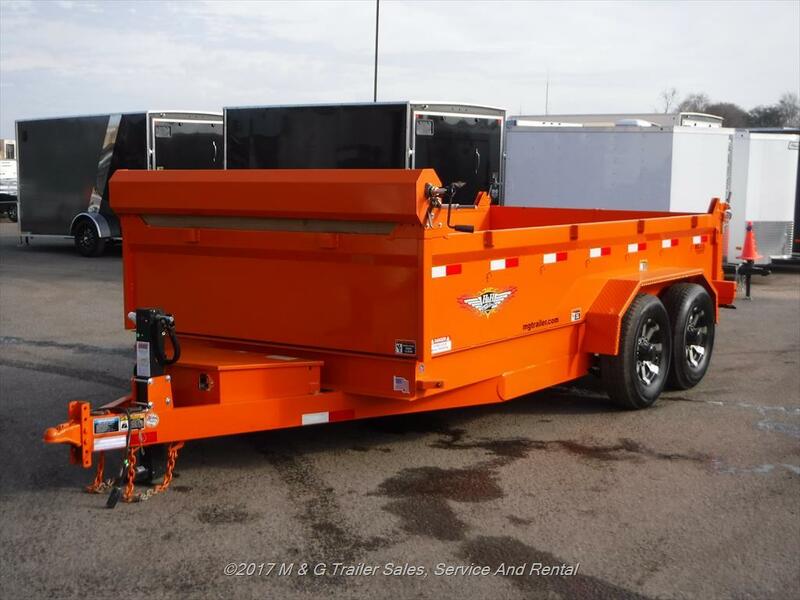 For more information on all the trailers M&G trailers has to offer, visit our dealership in Ramsey, Minnesota, or call us at 763-506-0930. You can also visit our website to see the great selection of trailers we have in stock.